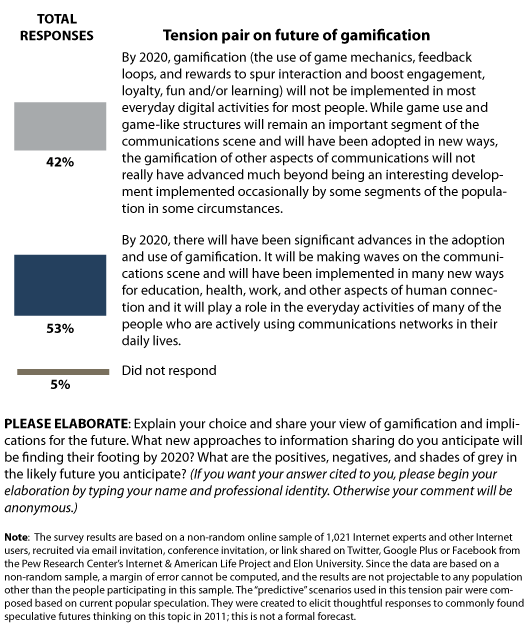 Main Findings: Getting into the gamification? Overall, a modest majority of the top tech experts participating in this survey believe game elements in some form will continue to play a role of gathering importance in the everyday activities of many of the people who are actively using communications networks. “The development of ‘serious games’ applied productively to a wide scope of human activities will accelerate simply because playing is more fun than working,” observed Mike Liebhold, senior researcher and distinguished fellow at The Institute for the Future. Survey respondents framed their conception of “gamification” in highly varied ways, ranging—in game-name terms—from massively multiplayer online games such as Star Wars: The Old Republic to World of Warcraft (a “virtual world”) to Farmville (social network-based game) to Angry Birds (popular smartphone app) to Foldit, a game that researchers used to crowdsource a scientific solution to an AIDS question, to training simulations, to the “points” (sometimes only in terms of social currency) one gathers for action in social interactions online, including having the most Twitter or Facebook connections or mentions. Following is a selection from the hundreds of written responses survey participants shared when answering this question. About half of the expert survey respondents elected to remain anonymous, not taking credit for their remarks. Because people’s expertise is an important element of their participation in the conversation, the formal report primarily includes the comments of those who took credit for what they said. The full set of expert responses, anonymous and not, can be found online at http://www.elon.edu/predictions. The selected statements that follow here are grouped under headings that indicate some of the major themes emerging from the overall responses. The varied and conflicting headings indicate the wide range of opinions found in respondents’ reflective replies. “Who’s going to argue against making things more fun?” asked David Weinberger, senior researcher at Harvard University’s Berkman Center for Internet & Society. A number of survey participants said young people now and in the future enjoy digital, social gaming, so applying game mechanics across all elements of their lives fits their communication orientation. Sandra Braman, a professor at the University of Wisconsin-Milwaukee and an expert on information policy, said a lot of energy will be invested in embedding game principles across more human activities between now and 2020, but she expects uneven results. “For all of the reasons that critics of game theory have identified over the years regarding its inability to capture the full range of human motivations, perceptions, cognitions, and practices, I believe there will be efforts to gamify much of what we do, but that much of that will just come and go as fads,” she wrote. People in interactive networks can be manipulated, and this is dangerous; could gamification lead to a Hunger Games world? As various aspects of science and technology evolve at an accelerating pace of change, there are concerns over the motivations of the organizations that have the money to do the type of research and development that best leverages the influences of networked interactivity. This becomes especially significant if motives are hidden so people are unaware of the potential consequences of their actions. “The findings yielded by the emerging field of neuroscience provide powerful tools to understand and hence manipulate the human brain,” said Simon Gottschalk, sociology professor at the University of Nevada-Las Vegas. “In light of advances in neuromarketing, there is no reason to believe that the most powerful economic entities are not going to use that knowledge (rewards, feedback loops) to spur interaction, boost loyalty (especially brand loyalty), and provide neural pleasures when consumers and customers do what they’re told. I do not see any positive in this development and am concerned about the use of that knowledge not only by economic entities but by political ones as well. “Gamification”? Can’t we come up with a better term for this? Many people think the term gamification is awkward, misleading, or so difficult to define it obscures more than it describes.